Slough was one of the very few good stories for Labour on the night of 1st May. Labour councillors were being ousted all over the country but in Slough, Labour bucked the trend and took control of the local council. Labour MP for Slough, Fiona Mactaggart was on Radio 4's Week in Westminster on Saturday explaining why this had happened. She pointed to a listening exercise that the party had held in the constituency. It doesn't appear, however, that the new Labour councillors are capable of listening to each other. Following a row over leadership of the Labour group, enough councillors have defected to put the Conservatives back in control with one local group of independents. Diana Coad, our candidate for the seat, told the Slough Observer that "we have enough councillors to take control. I can’t confirm how many new members we have because numbers are rising." Conservative blogger Tony Sharp finds the situation baffling and is unimpressed by the defection of councillors just days after they were elected under Labour colours. ConservativeHome is getting unconfirmed reports that one of the defectors has been made Deputy Leader of the Tory group. We hope to have more later today. Yesterday we published some excellent advice from Wakefield's Cllr Mike Walker. He offered great advice on how you can keep a new ward in the blue column. Because of last Friday there are three hundred or so new Tory councillors and they won't be short of advice over coming weeks. John Gummer, writing for Platform 10, is offering to put his Quality of Life group at new councillors' disposal. Write to him, he says, and he'll offer weekly advice on talking green - "the universal language". See here for more. "The most important pledge Conservative candidates made in most parts of the country was the pledge to keep the Council Tax down. So in those budget meetings for next year when officers tell them they need a large hike in the Council Tax for a “standstill” budget, Councillors should explain that this simply is neither true nor realistic. On taking office this May, Council Groups should impose staff freezes on administrative staff, and start to manage the numbers down. They should gain control over any decision to appoint external consultants, making sure when there are staff in the Council office who should and could do the job that they do it. They should review all the new initiatives and projects with an eye to suitability and cost." Please could you send me a list of the bodies we give grants to and the amounts? Please could you advise me what the Council's total annual spending is for a) Postage and b) Printing? How many empty Council homes (or ALMO homes) do we currently have? How many have been empty for more than six months? Have we considered selling those we can't afford to repair? What is our level of rent arrears? Could we install energy saving bulbs to our street lamps? What encouragement do we give to voluntary gardening assistance in our parks and public spaces? What consideration do we give to "designing out crime" on our estates? What is the total cost to the Council in interest payments on our debt is each year? How much do we spend on fees for our staff to attend conferences each year? How many staff are employed on a full time or part time basis to perform trade union duties and what is the total cost? Much more of the same here. "The internet really comes into on election nights, as I saw in that BBC pub I was in last night. The Beeb had to wait for results to be announced, as it has for decades, but the ConservativeHome team sitting opposite me had a constant stream of emails from Tory central office and councillors up and down the country feeding the gossip. We were waiting on them to see what’s happening." This year we'll be aiming to impress again with fast and furious coverage! We're going to be based inside CCHQ so, in addition to a great results service, we will be on the spot to talk to Eric Pickles, Shadow Local Minister Bob Neil and other key players. We need your help on the night. Please email us with any news from 'the frontline'. Please provide us with funny stories, interesting anecdotes and results. Do you have very young men or women standing in your area? Do you have candidates from interesting backgrounds? Are there any major Labour scalps that you are hunting? For election night we also recommend Iain Dale - who'll be blogging at the BBC - and PoliticsHome. As well as providing a constantly updated news service PoliticsHome will be providing transcripts from the night's TV and radio coverage. It aims to ensure you don't miss important statements from key party figures and the night's big winners and losers. Tory students, campaigning for local elections in Swansea, outdo a Labour student in the placard stakes. Click on the graphic to enlarge and look at the Labour guy's face! Vote Blue: Local elections are a chance to vote and send a message to the Labour Government, both locally and nationally. 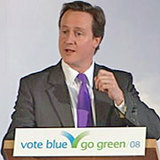 Go Green: Conservative councils are greener. They are leading the way in the fight against climate change. Save Money: Local people and communities expect their councils to deliver good service and value for money. Wasting public money is a slap in the face to people who live on tight budgets because council tax can swallow a significant part of their disposable income. Conservatives are on the side of hard-pressed taxpayers. We never forget that it's your money we're spending. Be Safe: Conservative councils are also safer. Our councillors are totally committed to fighting the crime, anti-social behaviour, and vandalism that ruins people's quality of life. 11.30am update: The Conservatives have produced a document detailing a large number of initiatives that show that Conservative councils are greener, cleaner and safer. Click here for the pdf version and here for the online flash version. The party will be fielding candidates in 95 percent of seats across England in the forthcoming local elections - more than both Labour and the Liberal Democrats. We have already noted that for the first time the party will be fielding a full a set of candidates in Yorkshire and Humberside and a full slate in Liverpool for a second time, and Iain Dale has noted that the Welsh Conservatives are fielding 41% more candidates than they did four years ago. Congratulations to everyone who has worked hard to make this happen: such as the Regional Directors, Agents, the Northern and Welsh Boards... and centrally people like Alan Mabbutt, Bob Neill and Eric Pickles. "These groundbreaking figures confirm that the Conservative Party is back in the north, and is gaining more and more traction across all parts of the country. Our organisation is stronger and more cohesive in places like the North West and Yorkshire, and this has paid dividends in the number of men and women wanting to stand for the Conservatives. These elections are being fought in traditional Labour heartlands, but they are finding it ever more difficult to twist arms and find people willing to be named as Labour candidates. As a result of hard work and commitment of everyone in the Conservative Party, we have outperformed Labour in all but one region in England, with brilliant performances in the North West, South West and Yorkshire. We are particularly pleased to have such a huge improvement in the number of candidates standing in seats across Wales and the North East, providing more people with the chance to vote Conservative on May 1st." Whatever the Mirror says, the Conservative Party is clearly making ground in the North. We understand that for this year's elections there will be Conservative candidates in every single contested ward in Yorkshire. Much credit is due to the committed activists such as former MP Michael Bates who are working hard to develop the party's presence there. Also worth noting is that Liverpool Conservatives - under the close stewardship of "Shadow Minister for Liverpool" Chris Grayling, Chairman Tony Caldeira, and Organiser Martyn Barber - are fielding a full slate for the second year in a row. 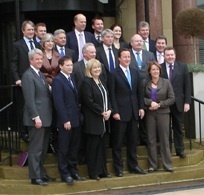 ConservativeHome has learnt that the shadow cabinet (some of them pictured on the right) has pledged the equivalent of 340 campaigning days to the local and mayoral elections over the next few weeks. This includes at least three days of campaigning per shadow cabinet member during recess. Eric Pickles MP, who has helped to organise campaigning that will see frontbenchers tour the whole country, said that it was the best ever response. William Hague is in Bradford today to launch the Tory campaign in that part of Yorkshire. "According to leading election expert Prof Colin Rallings of the LGC elections centre at the University of Plymouth, resurgent Tories could make gains deep in traditional Labour heartlands. The Tories require only two percent swings to win control of North Tyneside Council, registering their first metropolitan council in the north-east, as well as a first Welsh council in Vale of Glamorgan Council. A six percent swing on the 2004 result will win them Cheltenham BC. It will also be looking to retain Coventry City Council, a surprise Conservative win in 2006. Labour, in contrast, could lose control of Reading BC for the first time since 1986. Nuneaton & Bedworth BC, one of only four councils it controls in the West Midlands, could turn Tory on a four percent swing." Readers of ConservativeHome not already committed to local campaigns can register as a member of the national volunteer taskforce at CampaignTogether.com. This year, with the focus on metropolitan boroughs, sees the smallest set of annual local elections. With a third of councillors up for election in most contests there will not be many big changes in control. The Conservatives under David Cameron have been steady/ stuck at 27% in the metropolitans. When Labour last fought this year's seats - in 2004 - they were engulfed by events in Iraq and suffered their worst performance in thirty years. Gordon Brown will be hoping to win a few seats back - particularly from the anti-war Liberal Democrats who rode high then - but Labour's opinion poll rating is now below that of 2004 so the Labour leader might lose a few seats in his nightmare scenario. The Liberal Democrats face a squeeze from both main parties; Labour inching back in their urban heartlands and the Tories winning a few seats from them through active lovebombing. Team Clegg may lose 100 seats - the second year-in-a-row in which the LibDems would have suffered net losses in local government. In terms of individual seats the Conservatives are particularly hopeful of winning Basingstoke and the Vale of Glamorgan - a win in Wales that would be a good sign for our General Election hopes in that seat. The Tories fear a reverse in Chelmsford and are vulnerable in Hyndburn. Labour may lose Reading for the first time since 1987. The Conservatives are hoping for gains on the east side of the Pennines - where, at least until now, the Cameron effect has been weakest. Look out for Bradford (where the BNP has imploded and the shadow cabinet visited last week), Calderdale, Kirklees and Leeds. There'll be no spectacular gains but some new councillors will be an encouragement to the Tory leadership and to Campaign North. The elections in our northern targets will be the best resourced ever - partly because of Campaign North's promise to spend all money raised in the north, within the north. The big story of 1st May won't be the local council results but the outcome of Ken Livingstone versus Boris Johnson - a race which Boris currently leads. The Conservatives are expected to remain the biggest party on the GLA but more interesting may be the performance of smaller parties. Is this the year that the BNP makes a breakthrough in London?